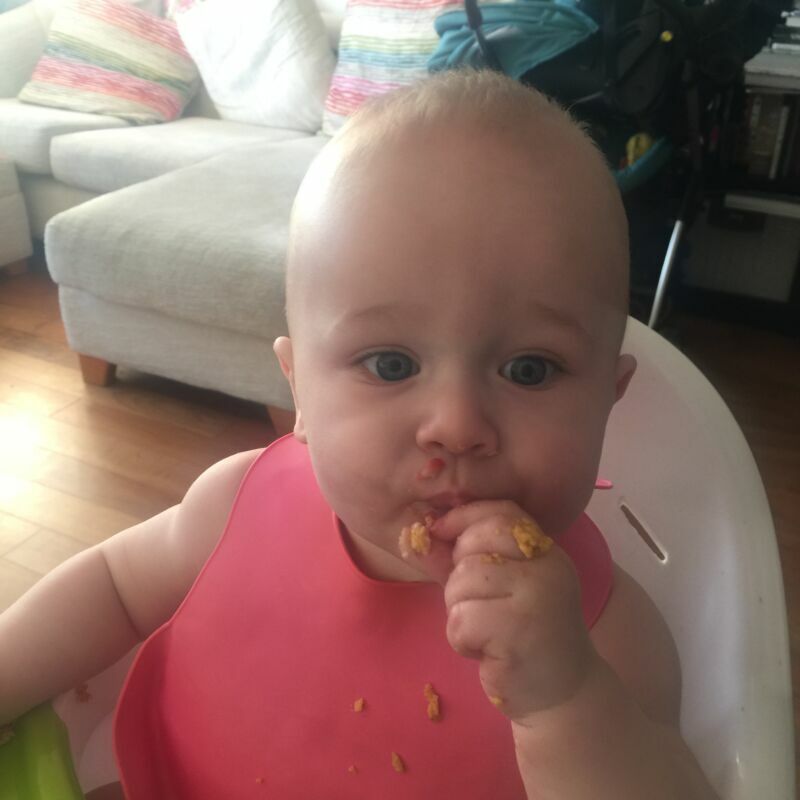 As I am sure my regular readers are aware, we love a baby led weaning pancake! We’ve tried banana pancakes, sweet potato pancakes, scotch pancakes and now we have this baked pancake recipe. This baked recipe is totally baby led weaning friendly. There’s no added salt or sugar; it uses unsalted butter and the fruit makes it sweet enough. It takes only 25 minutes to bake and can be left to do so while you get on with doing something else. 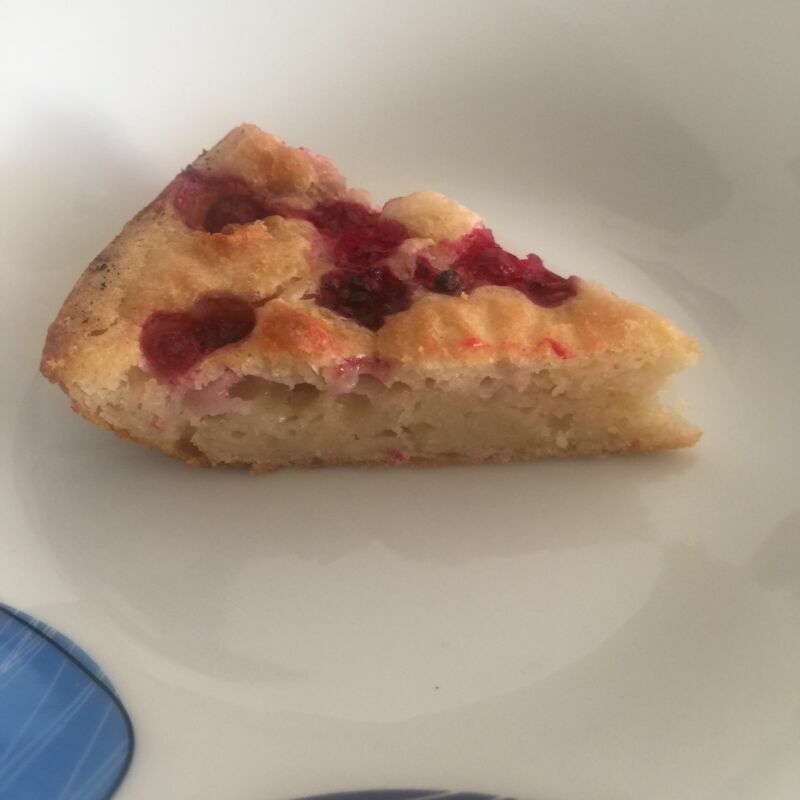 Best of all, the baked pancake tastes incredible! 1.Place a cast iron pan into the oven at 190C (180C fan) while it preheats. 2. In one bowl add flour and baking powder and combine. 3. In another bowl, whisk an egg until frothy, then add milk and 2 tablespoons of melted butter. 4. 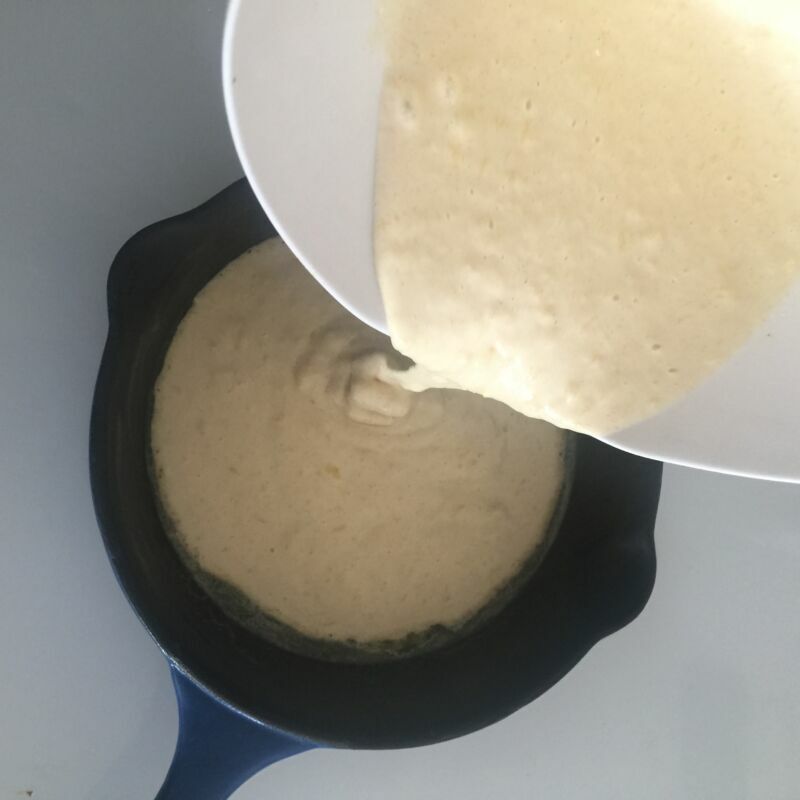 Combine the egg/milk mixture with the flour and mix until a batter forms. 5. Once the oven is preheated, carefully take the pan out and add the final tablespoon of butter. Ensure the butter reaches all areas of the pan to sufficiently grease it. 6. 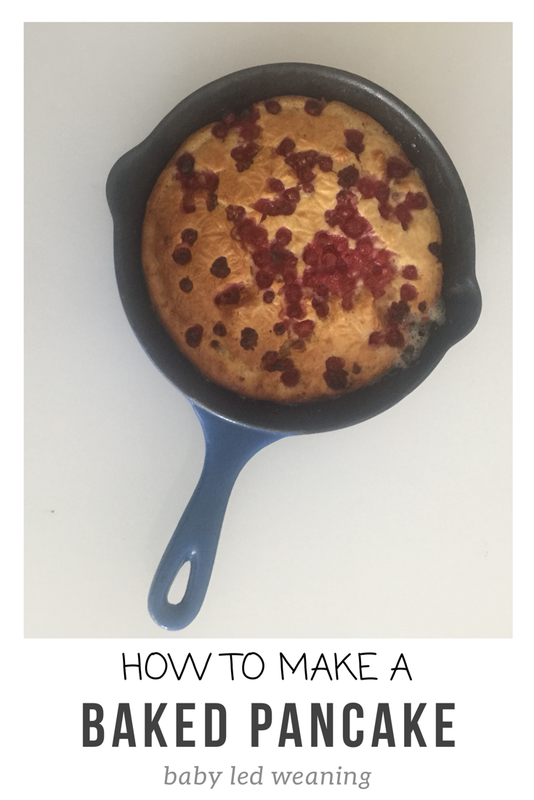 Pour the pancake mixture into the pan, then stop with berries of your choice. The baked pancake was enjoyed by everyone, especially Dexter. It’s definitely one I’ll be trying again with a variety of fruit. I was a bit worried that it would come out tasting like a Yorkshire pudding; don’t get me wrong, I LOVE Yorkshire pudding, just not in this setting. However, it tasted just like a regular pancake, with yummy crispy edges that tasted like a cookie. Let me know if you try it and what you think! You can see more of my delicious recipes here. Place a cast iron pan into the oven at 190C (180C fan) while it preheats. In one bowl add flour and baking powder and combine. In another bowl, whisk an egg until frothy, then add milk and 2 tablespoons of melted butter. Combine the egg/milk mixture with the flour and mix until a batter forms. Once the oven is preheated, carefully take the pan out and add the final tablespoon of butter. Ensure the butter reaches all areas of the pan to sufficiently grease it. 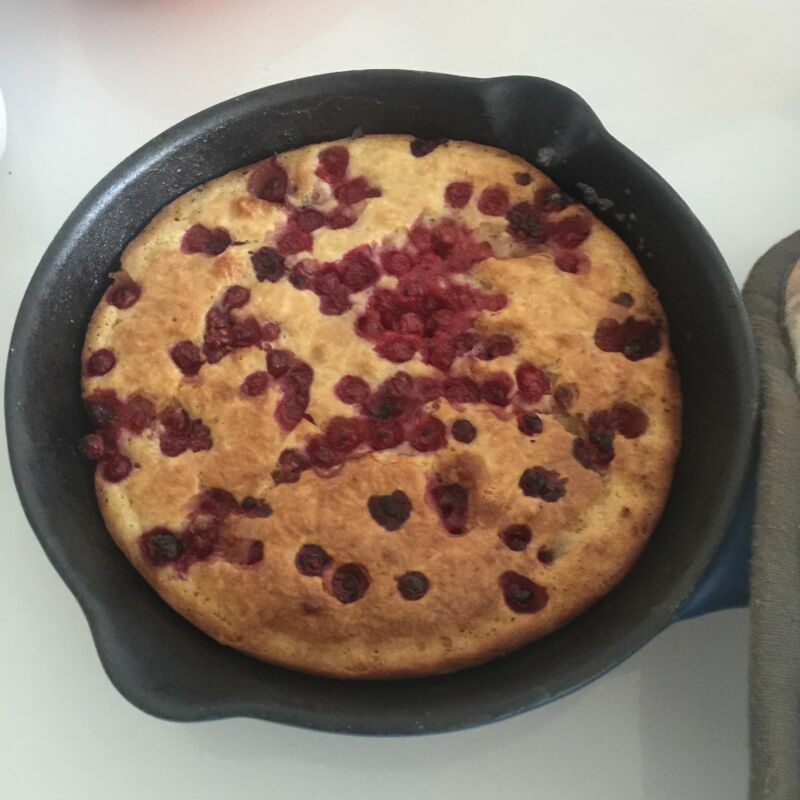 Pour the pancake mixture into the pan, then stop with berries of your choice. This looks SO yummy! I’ve never tried a baked pancake before but we’re going to have to try these.